Combine the dry ingredients. Mix in melted butter and press into greased 9” (with coconut oil or butter) springform pan. Beat softened cream cheese until smooth and creamy. Add powdered truvia, both of the flours, and vanilla. (Mix well!) Add lightly beaten eggs, mixing very briefly. Melt two of the cocoa bars and sweeten to taste with powdered truvia or stevia to make a chocolate sauce. Sweeten according to your taste, but it should be nice and sweet. Add a pinch of salt. Stir the chocolate sauce into one half of the batter. Pour over crust. Stir the coffee into the other half and spoon over the chocolate layer. This sounds and looks amazing. Thanks for sharing the recipe. I am curious, with this dessert do you let people know there are nuts in it? I have a daughter with anaphylactic nut allergies. I always hope that people are conscious of that and share that information when the nuts are not obvious. 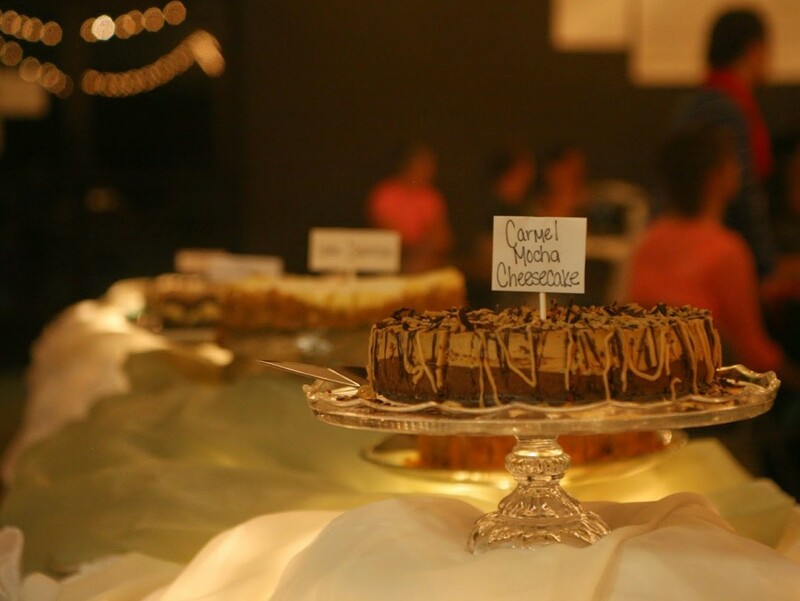 Out of all the wonderful-looking desserts displayed that night at the ladies’ conference, I chose this one and – wow – a great choice! Absolutely delicious. Thanks for the recipe!! I’m so glad you enjoyed it, Cathy! I enjoyed making it for you ladies. Good morning, Cindy! This looks amazing…never did I ever realize that I could eat such wonderful food and not eat sugar! My question is, have you ever frozen cheesecakes, and do you think they are as good as fresh? 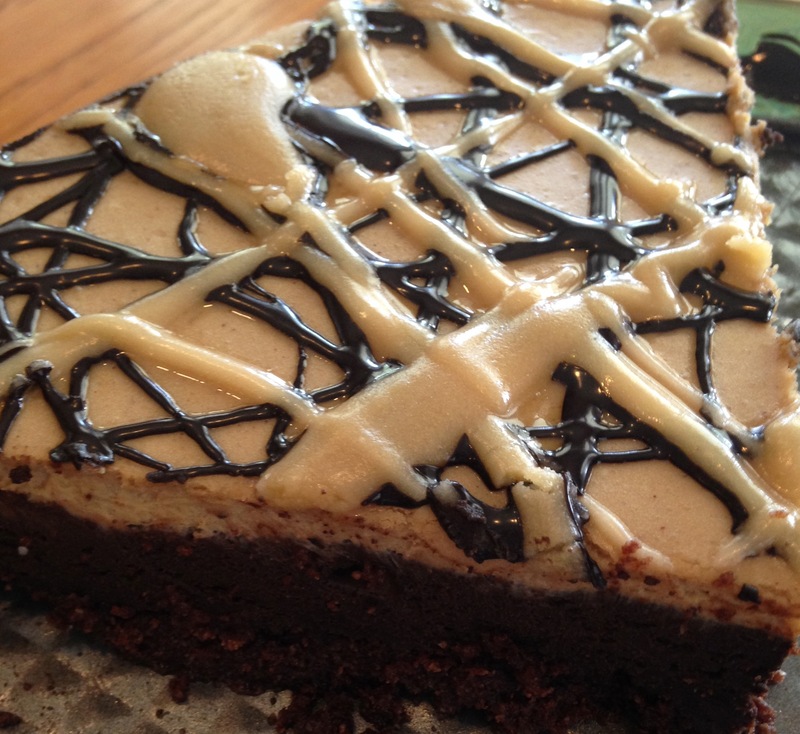 I am planning to make my coffee loving daughter this cheesecake for her birthday. Good morning, Cindy! Just stopped by the site to print out this recipe; can’t wait to make it this afternoon and take it to the fellowship dinner at church tomorrow! With the record you have for delicious recipes I have no doubt this will be awesome, too! 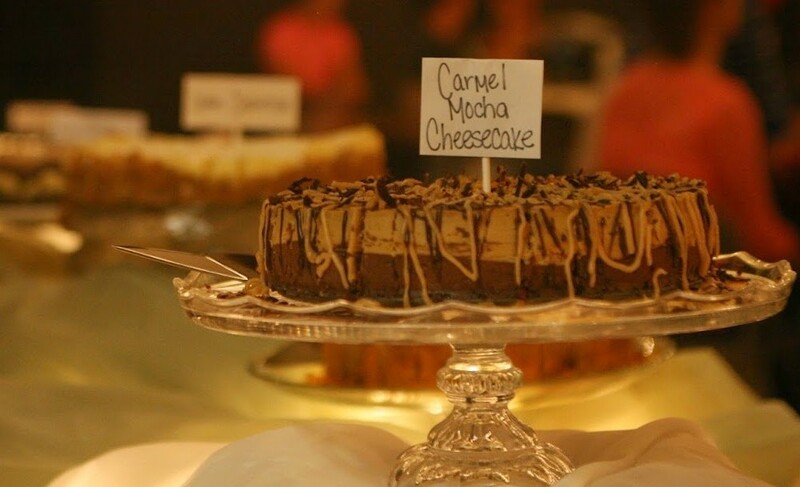 Also wondering… are the cinnamon rolls you have pictured with your caramel sauce THM? If so, I would love that recipe some time. i would love to know the amounts you use to make your own truvia. That is if you dont’ mind sharing!! Wow, this is amazing! Time consuming, but worth it. I was so nervous seeing all the $$ going into this recipe, but I am so glad I made it. We aren’t huge coffee lovers and 2 T. coffee instead of 3 is strong enough for us. Thanks Cindy! It’s my daughter’s 12th birthday cake and she has not detected a THM flavor! I just made this for the first time to share at our local THM group, and it was delicious and got good reviews! Thanks so much for the recipe! I am making this for the first time. Sounds delicious I have one question. On the chocolate bars you used 3 whole chocolate bars 4.4 oz each? Hi Anita! I used 2 of the 4.4 oz. bars for the cheesecake and then just a small part of the third one was for drizzling on top. At Aldi’s you can buy one bar for around $1.89. I don’t buy it anywhere else because it’s a lot more expensive at most other places. I hope it turns out great for you! I made this cheesecake and took it to a church fellowship dinner. I tasted it and thought I got the coffee flavor a bit strong, but people loved it and all I had to take home was one piece. I’m glad everyone enjoyed it! =) You can adjust the coffee flavor to your personal taste.